Hampshire chairman Rod Bransgrove has welcomed the move to take a fresh look at a new 'English Premier League' Twenty20 competition. A recent meeting brought together the chairmen of the 18 counties to discuss the overall state of the domestic game. Among the items discussed was a T20 event similar to the Indian Premier League (IPL) or Australia's Big Bash. "We seem to have missed the boat in terms of the escalation of T20 around the globe," he told BBC Radio Solent. "We are quite hopeful there could be a new dawn." The current domestic T20 competition, involving traditional county sides, predominantly features matches on Friday nights, with this year's schedule stretched out from mid-May until late August. But many would like a more condensed competition, specifically for the T20 format, with fewer teams. The possible introduction of city-based franchises, like those which compete in the IPL and Big Bash, has also been mooted. Yorkshire chairman Colin Graves is in the running to take over as the English & Wales Cricket Board's (ECB) new chairman, and the former convenience-store entrepreneur has promised a "top-to-bottom review of cricket" in the UK. 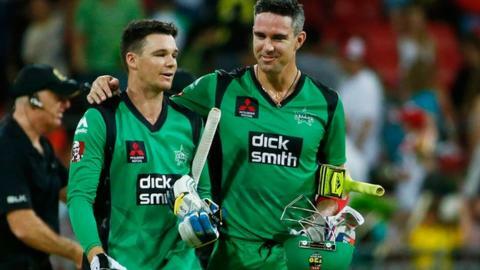 "Everything I've seen about Colin is pretty open-minded and he's seen the IPL and the Big Bash and knows how good these competitions can be if they're done correctly," said Bransgrove. "Nearly one million viewers watch the Big Bash every night on free-to-air TV, but even more importantly, over 800,000 will have been to a match - an average of 23,000 per match. Frankly we haven't even got grounds big enough to hold those kinds of crowds, but it demonstrates what can be done with a properly entertaining T20 tournament. "With the counties at grassroots level, they are often struggling financially and we need to start the model with a financially viable competition and work out from that." Bransgrove said the Ageas Bowl, the home of Hampshire, would be one of the venues likely to hold the new tournament, but he was keen to stress that it would be a collective arrangement. "I regard the Ageas Bowl as one of the stages for the competition but it belongs to cricket - that's the concept people need to understand," he said. "It's not about having an advantage over, say Leicestershire. It's about all the counties sharing in the wealth that a properly conducted T20 tournament would be able to achieve." Getting things done: Does democracy matter in sport? Read more on Getting things done: Does democracy matter in sport?